The exhibition “Versions – The Artists’ Library” presents the ground floor of the GfZK as a forum for eight international artists who show their ideas on the subject of libraries. The term library is linked to many other topics and interactions. Some artists understand the library as an archive and deal with their ordering system. Others, on the other hand, focus on the interactive function of spaces, on the areas that are available as places of reading and working for visitors to a library. Writings and books, concepts that are inseparable from the library, form the starting point for further work. Real and fictional positions are juxtaposed. The sculptural, functional, poetic displays allow to develop a new view of the library. Tobias Rehberger’s “Bibliothèque Horizontale” arranges – as the title implies – the books for a subjectively chosen color system horizontally, with the title page lying on the floor. The books are given a primarily decorative function. Huge ashtray-filled cigarettes filled with remnants of cigarettes, living room lamps, and comfortable seating associate privacy in a public area. Clegg & Guttmann’s installation “The Seven Bridges of Königsberg” goes back to reflections on an “Open Library” in Duisburg in 1999. Here, the artists draw on a mathematical problem solving by Leonhard Euler (1707-1783), with which he devoted himself to the so-called Königsberg bridge problem: How to cross the seven bridges of the city over the river Pregel exactly once and get back to the starting point? The structure of the work of Clegg & Guttmann is based on the 1736 Euler created diagram, with which he proved the impossibility of such a tour. In the library of Clegg & Guttmann it is not possible to arrange the books in alphabetical order when all shelves are filled. 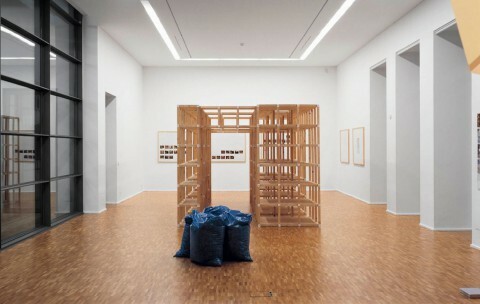 The shelves remain empty for the exhibition in Leipzig; the structure comes to the fore. 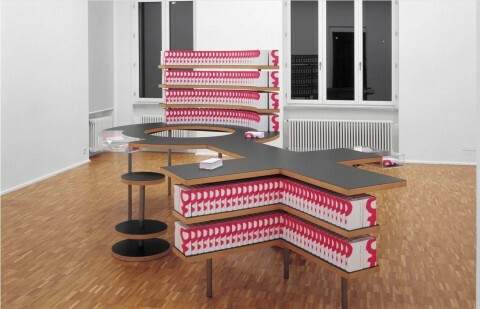 The artistic exploration of libraries, which began in 2008, continues in 2009. As part of this program focus, another artist, Till Exit, will develop a large-scale, usable work in the basement of the GfZK, where the GfZK library has been housed since 1998. The interior – living room chairs from the 1950s and 1960s, which Exit had collected for a temporary project – creates the impression of privacy in the GFZK library. The library of the GfZK, which was created in 1992, is a publicly accessible reference library that holds German and foreign language books on various research topics. The knowledge storage including book collection forms an integral part of the GfZK. The exhibition was curated by Edina Nagy. After Edina Nagy completed her studies in Art History, Media, Aesthetics and Hungarian Language in Hungary, Nagy was trainee at Gemäldegalerie Berlin and a PhD student at the Berlin University of the Arts. Next to the scholarship from the Cultural Foundation of the Free State of Saxony she received a scholarship from the Cultural Fund of Hungary, as well as the Paul Celan scholarship for translators from Vienna. She was and is a lecturer at the University of Arts Hungary and the Eötvös Loránd University (ELTE) in Budapest. At the same time she works as a curator.